Cincinnati Metro CEO Dwight Ferrell tendered his resignation Tuesday morning at the transit agency board's monthly meeting, effective Jan. 31. Ferrell began a four-year contract with the Southwest Ohio Regional Transit Authority -- which owns and operates Metro -- in 2014. SORTA Board of Trustees chairman Kreg Keesee said that Ferrell would remain on retainer as a consultant for the next six months. 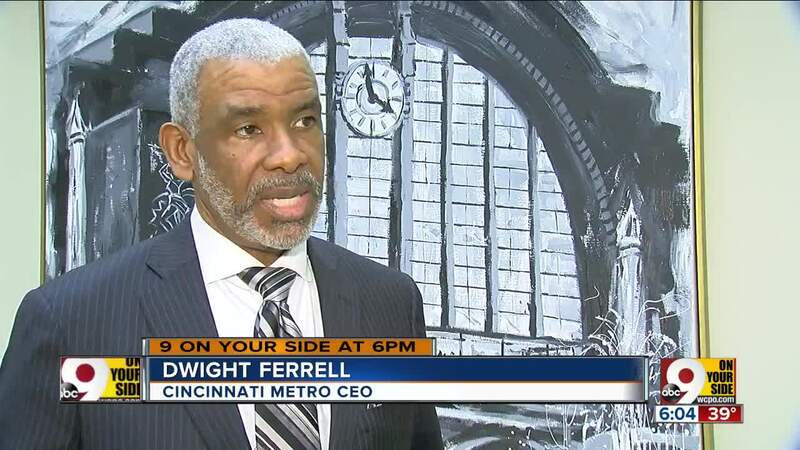 CINCINNATI — Cincinnati Metro CEO Dwight Ferrell tendered his resignation Tuesday morning at the transit agency board's monthly meeting, effective Jan. 31. Ferrell began a four-year contract with the Southwest Ohio Regional Transit Authority -- which owns and operates Metro -- in 2014. SORTA Board of Trustees chairman Kreg Keesee said that Ferrell would remain on retainer as a consultant for the next six months. "This is not abrupt. This is something that I've thought about. It's just the right time," Ferrell said. SORTA COO Daryl Haley will serve as interim chief executive until the board appoints a new CEO. Ferrell came on board with SORTA as it became clear the transit agency's funding model would not remain sustainable. Ridership has declined steadily year over year since 2012, and Metro faces a looming $160 million budget gap over the next decade. The question of a transit tax remains in limbo with Ferrell's exit: In 2017, the board opted to wait until 2018 to propose a county-wide sales tax levy for improved bus service. In July of this year, the board opted again to wait until 2019 . Cam Hardy, with the grassroots transit group the Better Bus Coalition, said he hopes a new CEO will mean quicker action on a transit tax levy. "We want a seat at the table for the next CEO," Hardy said. "This person would definitely be spearheading a levy and it's important that they are excited and engaging with the community." Hardy said he worries about what he called a "very high turnover" rate in the transit agency's top seat. "Why not just let me run the transit system and bring some stability to the organization?" he said, tongue-in-cheek. Also during Tuesday's meeting, Keesee said the board has begun its annual process of selecting a board chair and vice chair. The board will consider candidates for those seats at its January meeting.